Gov. Andrew Cuomo’s recent assertion that Comptroller Tom DiNapoli should “educate himself” and that the comptroller’s audits on state economic development projects are “dead wrong” and “opinion” drew a lot of attention. Many Albany observers took it as a sign of Cuomo’s growing sensitivity to criticism about his signature projects. Those projects, like the Buffalo Billion, are the subject of a federal investigation headed by U.S. Attorney Preet Bharara. The state Legislature remained fairly removed from oversight of the projects until very recently. However, several government watchdogs say that Cuomo’s attacks on DiNapoli are part of a long-running pattern of Cuomo trying to weaken the comptroller’s oversight of the executive branch. “The governor hates oversight and the governor actively works to undermine and weaken anyone who is keeping an eye on him,” said John Kaehny of Reinvent Albany, a group that has closely followed the Buffalo Billion economic development project. Kaehny noted that Cuomo and the Legislature approved a measure in 2011 that prevented DiNapoli from reviewing contracts at SUNY and CUNY ahead of time. “The governor has been undermining the comptroller from his first budget,” said Kaehny of Cuomo, who took office in January 2011. A recent DiNapoli audit of the Empire State Development Corporation’s Excelsior Jobs Program, which gives businesses refundable tax credits for creating jobs in certain areas of the state, found that there wasn’t proper oversight to make sure companies were providing the jobs they pledged to create and that they weren’t simply relocating jobs from elsewhere in the state. Further, the audit found ESDC didn’t obtain the proper paperwork to justify handing out tax breaks to some organizations. Cuomo told reporters that DiNapoli’s audits on his economic development programs are invalid partly because DiNapoli is a former member of the state Assembly. The combination of comments appeared aimed at undermining DiNapoli’s work and authority, and fit the Cuomo mold of punching back at critics, whether they are advocates, local elected officials, or the elected chief fiscal officer of the state, DiNapoli. Empire State Development issued a detailed rebuttal to DiNapoli’s Excelsior audit that challenged some of its more damning assertions. ESD claimed DiNapoli’s staff failed to grasp how the program actually works and the mandate of certain statutes. DiNapoli’s office responded that ESD staff had not been cooperative. Jason Conwall, spokesperson for ESD, issued a statement to media outlets after the report was released, stating: "Any truly objective review would show this program is cost-effective, performance-based, and incentivizes business growth by only providing tax credits to those that have achieved their job commitments and investments. The reporting requirements to this agency, as well as to the Department of Labor, are rigorous and companies have to demonstrate to ESD that they met their job commitments before any credits are issued." 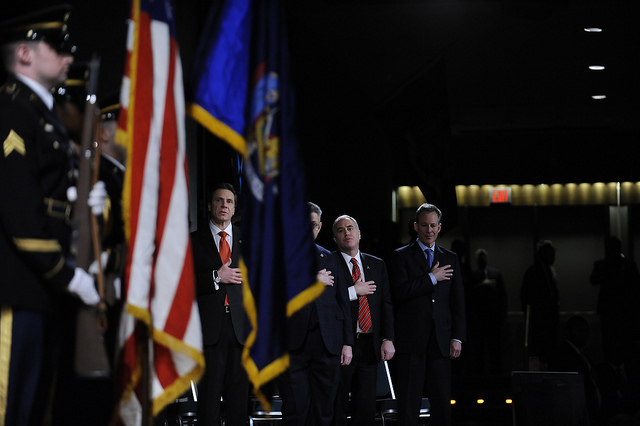 The comptroller also recently released audits of Cuomo’s Charge NY program and of Medicaid. DiNapoli’s Medicaid audit found dead people were still receiving benefits. Cuomo’s dismissal of the comptroller’s audits seems to discount the fact that the comptroller oversees an army of professional auditors that base their reports on figures and facts. E.J.McMahon of The Empire Center, a conservative think tank, said that it is generally expected that there will be tension between a Comptroller and Governor and that it is unsurprising that Cuomo, who has a reputation for “ad hominem denunciation” over “the substantive argument,” is feuding with someone charged with monitoring him. Yet accounting for those points, McMahon said there is still something surprising about Cuomo’s animosity toward DiNapoli. Representatives from Cuomo’s office repeatedly pointed to press releases of critical audits by DiNapoli’s office as salacious, saying they do not jibe with what is contained in the reports. During legislative hearings on economic development programs held earlier this month, administration officials quizzed on DiNapoli’s audit failed to provide detailed rebuttals, only indicating they did not agree with the audits. Cuomo spokesperson Dani Lever said in a statement, “When someone makes false or misleading attacks, our administration aggressively defends and corrects the record and we make no apologies for doing so.” She did not offer comment to the assertion that Cuomo has worked to undermine the comptroller’s office. She also did not respond to a request to elaborate on what might have been “false” in DiNapoli’s audits. Cuomo and DiNapoli are both Democrats. In October, as news about Bharara’s investigation broke, DiNapoli faced questions about why his office wasn’t more involved in providing oversight into how two SUNY nonprofits were awarding million-dollar contracts. He told Susan Arbetter of The Capitol Pressroom that Cuomo and the Legislature had taken away his ability to review contracts before they were issued by SUNY and CUNY. Kaehny of Reinvent Albany said that it is important to note that these powers were stripped from DiNapoli as the Buffalo Billion program began to take off. “The governor has worked methodically to undermine and resist the comptroller’s oversight. His first budget stripped the comptroller’s oversight over SUNY Research Foundation, which has been essential in the unfolding scandals in what appears to be pay-to-play for millions of dollars of contracts,” said Kaehny. Just as McMahon said, many watchdogs see Cuomo’s reaction to DiNapoli’s audits as concerning because they don’t believe DiNapoli has been as critical as he could be and has not hit some of the more sensitive areas of Cuomo's economic development programs. In New York City, Comptroller Scott Stringer has released a series of troublesome audits of city government, which have painted different levels of waste, dysfunction, and ineffectiveness by the administrations of Mayor Bill de Blasio and his predecessor, Michael Bloomberg. While de Blasio has contested different points and looked to downplay the findings, he and his administration have not dismissed the office as one that simply delivers ‘opinion.’ Nor has de Blasio called Stringer’s work politically motivated, even though Stringer is thought to be a potential 2017 challenger to de Blasio. Asked about the conflict between Cuomo and DiNapoli on Thursday, de Blasio said that he wasn’t familiar with all the specifics, but that the comptroller was asking “valid” questions about the efficacy of economic development programs and that he’s known DiNapoli to be a “a very serious public servant.” “And obviously the state Comptroller should be respected,” de Blasio added. Former Gov. George Pataki had a relatively cordial relationship with Comptroller Carl McCall despite the fact that McCall was a political rival. Former Gov. Mario Cuomo’s dislike for Republican Comptroller Edward Regan was not much of a secret - Regan was considered a possible serious challenger, though he never ran for Governor. The New York Post recently reported rumors that DiNapoli could challenge Cuomo in a 2018 primary and capitalize on Cuomo’s weakness with liberal voters. DiNapoli dismissed the notion in an interview with Politico New York and said he plans to run for re-election as Comptroller. Note: this article has been updated to include ESD rebuttal to the Comptroller's Excelsior audit. Considering all of the political posturing and seeming lack of coordination between city and state officials, the fact that eyes and efforts are being trained on substandard shelter conditions for tens of thousands of New Yorkers who lack stable housing, this source of agreement may lead to positive results. "Homeless people don't want to go into a shelter," Cuomo said Monday during an aside as he gave a speech on his minimum wage push. "Why? Because it's dirty, it's unsafe. So they're staying out on the street...It's just not right...It's not right to have a shelter system that is so dirty and unsafe, that people have to stay on the street corner." "Shelters absolutely have to be improved," de Blasio said Monday as he continued to be peppered by press questions about Cuomo's new executive order, which was announced Sunday and deals with homelessness in several ways, including insisting that shelters are in good condition. As Cuomo acknowledged to reporters on Monday, the state has oversight of homeless shelters across New York. "There's been a safety issue in shelters for years, in fact for decades," de Blasio said, in what is a common refrain: that his administration is taking steps to mend a mess it inherited. On Monday, de Blasio again pointed to the "shelter repair squad" that the city announced in May after a damning Department of Investigations report (which de Blasio had asked for), and said that "there are very real things that have to be fixed in our shelters...we're on the case." For many, though, de Blasio isn't acting quickly or effectively enough in reducing the city's street and shelter homeless populations, which total around 60,000 people, or in improving the quality of the city's shelters. Thus leading to Cuomo's executive order and his promise to lay out new policy this month. A recently released audit from Comptroller Scott Stringer - which Cuomo referenced on Monday - brought further detail to shelter problems. Calling the audit a "damning commentary on the shelter system," Cuomo said he'd be "contacting the comptroller, literally this week" to go over the report and Stringer's proposed remedies. Stringer's audit shows deplorable conditions in many shelters and a lack of city oversight of shelter providers with whom they contract. In response to the audit, the de Blasio administration said it largely agree with Stringer's recommendations and explained that progress was already being made, including in terms of the repair unit, which, it said on Dec. 21, had "already cleared more than 12,000 violations and will continue until all are cleared." De Blasio and his aides have continued to push back against some of the criticisms of their management of the homelessness crisis while the city also undergoes a shakeup in leadership and a reassessment of all aspects of its approach to the issue. They cite major increases in rental assistance programs and a significant increase in funding toward new supportive housing units, calling on Cuomo to match. And, even as that 90-day review progresses, new homelessness-related policies have been rolled out by de Blasio and Steve Banks, commissioner of the city's Human Resources Administration and the administration's point-person on homelessness. One of those announcements also came Monday: a plan to phase out so-called cluster site homeless sheltering over the next three years. Cluster siting means apartments being rented by the city as shelters, for which the city pays landlords above market-rate prices to provide shelter and services. But, this approach has proven ineffective on several levels, including the condition in which many landlords keep the cluster units - they had been found to be in the worst condition of all shelter types by the DOI. The governor's executive order, which goes into effect Tuesday, includes a mandate that shelters are kept in good condition: "I direct all local social services districts to comply with their obligation to ensure that all facilities used for temporary housing assistance placements are safe, clean, well maintained and supervised and fully compliant with existing state and local laws, regulations, administrative directives, and guidelines," the order reads. Stringer's audit says that the city has been placing "homeless families with children in shelters plagued by rodents, mold, peeling paint, and broken windows," among other structural and maintenance problems. There are also problems with theft and violence at and around some shelters. De Blasio said multiple times Monday that the city must "fix" shelter problems and indicated he feels the city is on the right track. Banks said progress has been made, but also that these processes are under review like everything else involved in the city's approach to homelessness. Cuomo said on Monday that he would be laying out a "comprehensive plan on the entire matter" in his Jan. 13 State of the State and budget address. He indicated that improving the shelter system will be a part of that plan, saying, "We have to improve the shelter system, one way or another." Shelters in all New York municipalities are under the governor's purview, of course. 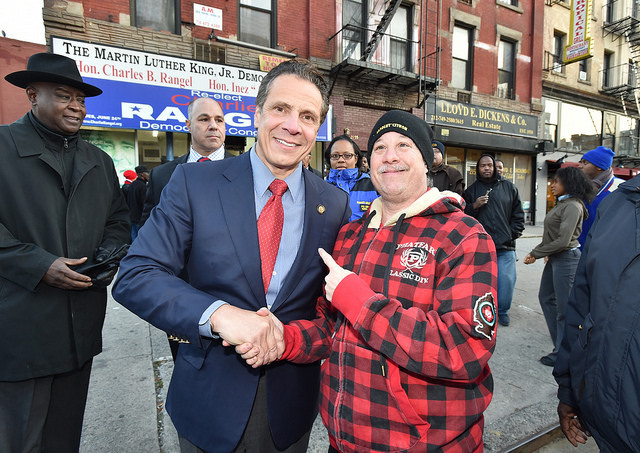 "The state regulates the city system," Cuomo said Monday. "The constitutional responsibility runs to the state. The state delegates the responsibility to local - what they call local service districts - basically, cities. We regulate and we reimburse the shelters all across the state. If shelters are not up to code, then we are going to be very diligent in our inspection and management of the existing shelter system. I'm going to lay out that program in the State of the State." Though they may not be working hand in hand, Cuomo and de Blasio both now own the homelessness crisis, including the shelter crisis therein.